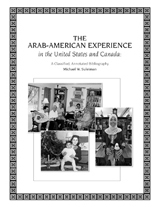 The Arab-American Experience in the United States and Canada: A Classified, Annotated Bibliography: This bibliography is the first comprehensive attempt to identify, organize, evaluate and describe the extensive literature on the Arab community in the United States and Canada -- a particularly timely topic. The author, Michael W. Suleiman, spent twenty-five years compiling this immensely valuable bibliography. No. 33: Managing Library Instruction Programs in Academic Libraries. This volume presents advice and insightes -- based on experience -- for managing effectively all aspects of a library literacy program. No. 32: First Impressions, Lasting Impact: Introducing the First-Year Student to the Academic Library. The conference proceedings explore ways to convey library literacy skills that will empower this special group of library users for a lifetime.